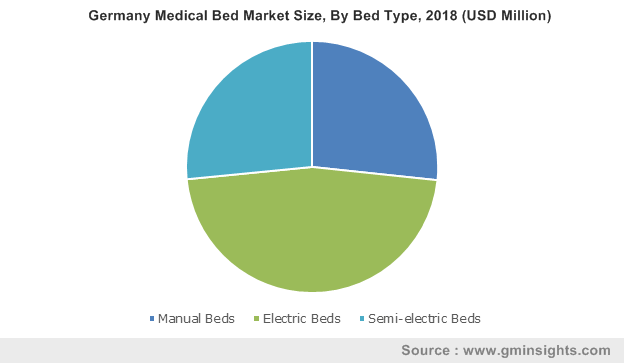 Medical bed market size was valued at USD 3 billion in 2018 and is expected to witness 5.7% CAGR from 2019 to 2025. 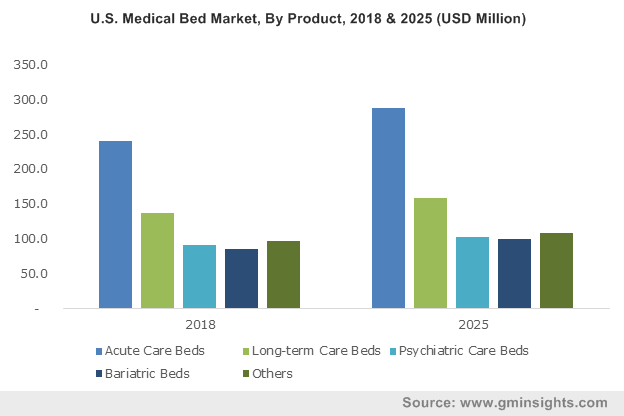 Increasing number of baby boomers, suffering from numerous diseases due to functional and anatomic changes will drive the medical bed market growth. Ageing population susceptible to injuries, falls and physical disabilities will act as a primary driver for medical bed industry growth. As per the World Population Prospects data, elderly population base is expected to more than double and triple by 2050 and 2100 respectively. Rapidly growing elderly population base susceptible to chronic conditions will surge the demand for medical bed in various settings including homecare, thereby augmenting business revenue over the coming years. Growing prevalence of chronic disease worldwide, increases the burden on healthcare systems and fuels demand for proper healthcare facilities to the patients. Government measures such as Healthcare Transformation Plan (HTP) to build diagnostics centers, clinics & hospitals and renovate hospital infrastructure, in the coming five years to cater to patient needs will further favour industry growth. However, excessive cost of specialty bed and decreasing volume of bed in public hospitals especially in underdeveloped economies may impede the market growth over the forecast period. Acute care bed segment accounted for more than USD 1.5 billion in 2018 and is poised to grow at significant rate by 2025. Multifunctional applications of acute bed in curing illness, providing definitive injury treatment as well as protecting against exacerbation or complications will increase its demand during the forthcoming years. Increasing demand for the product is observed due to growing elderly patient base suffering from chronic disorders. Bariatric bed segment is anticipated to witness lucrative CAGR of 3.1% over the forecast period. Rising prevalence of obesity will surge the demand for bariatric surgical procedures such as stomach reduction and gastric bypass thereby fostering business growth. Sedentary lifestyle and unhealthy dietary habits leading to obesity will further spur the bariatric bed segment size. Electric bed segment was valued over USD 1.3 billion in 2018 and will show similar trend during the analysis timeframe. Rising use of electric bed for home care settings and hospitals owing to the conventional control techniques of the electric bed will drive the segment growth. Associated factors such as enhancement of resident mobility and ability of disabled patients to operate the adjustable features of electric bed effectually decrease long-term care burden thus, increasing its adoption in the foreseeable future. Semi-electric bed segment accounted for considerable revenue share in 2018 and is estimated to show 5.8% CAGR over the forecast period. Segment growth is attributable to advantages offered by these bed including ease of assembling and disassembling, superior strength, durability and strengthened head sections that reduce the risk of torqueing and offer supplementary support. Non-intensive care segment held more than 56% revenue share in 2018 and will exhibit significant growth over the forecast timeframe. Segment growth is attributed to rise in incidence of hospital-acquired pneumonia (HAP) in non-intensive care units especially among the non-intubated adult patients. Intensive care segment is estimated to witness 4.6% CAGR during the analysis period. High demand for intensive care services and rising focus on bed availability to address capacity planning challenges will drive the business growth. Increasing bed occupancy rate and high patient wait times in developing economies will propel the demand for medical bed in intensive care units thereby, augmenting the business size. Hospitals segment was valued more than USD 2 billion in 2018 and will exhibit significant growth over the forecast timeframe. Segment growth is attributable to rising number of patient visits coupled with increasing number of surgical procedures that occurs mostly in hospitals settings. Home care settings held significant revenue share in 2018 and will witness 3% CAGR by 2025. Segmental growth is attributable to increasing patient preference towards home care. Benefits offered by home health care such as less expensive, more convenient and effective care as compared to hospitals will drive business growth during the forecast period. North America medical bed market accounted for around 23.5% revenue share in 2018 and will witness similar trend over the analysis timeline. Regional growth is attributed to high healthcare expenditure and patient awareness about the benefits of early disease diagnosis and treatment. Moreover, advanced healthcare infrastructure coupled with availability of advanced technologies will positively influence the regional market growth. Strong foothold of major industry players in North America will further augment medical bed business growth. Asia Pacific medical bed market is estimated to show robust CAGR of 9.4% during the forthcoming years. High growth can be attributed to increasing government support and healthcare reforms in the country. 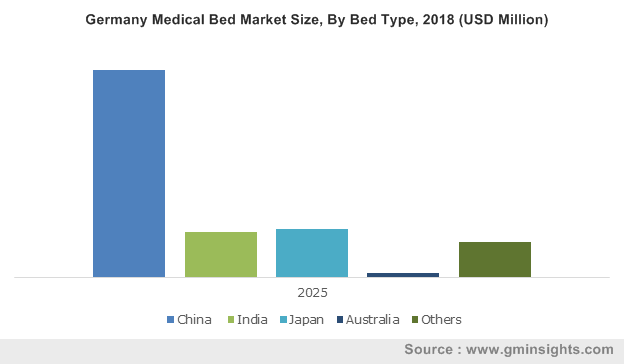 Moreover, increasing demand for medical bed in highly populous countries such as China and India will further drive Asia Pacific medical bed industry growth in the coming years. 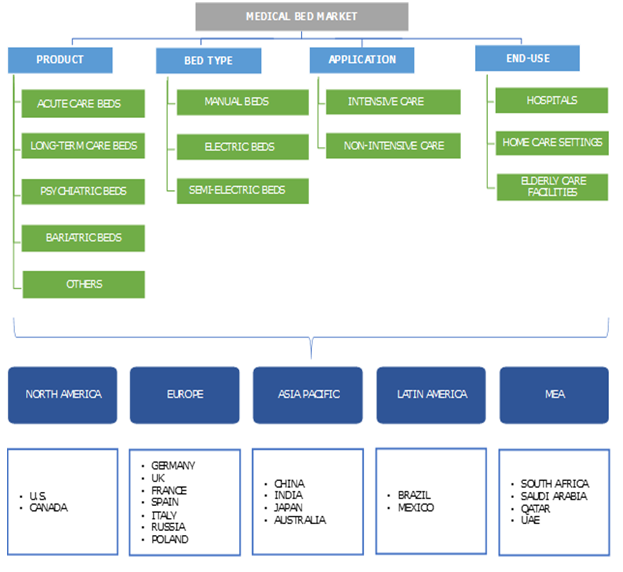 Some of the key industry players operating in the medical bed market include Getinge, Antano Group, Gendron, Besco Medical, GF Health Products, Hard Manufacturing, Midmark, Hill-Rom Holdings and Invacare. These players implement strategies such as acquisition, merger, partnerships and novel product launch to capitalize on market opportunities and strengthen market position. For instance, in October 2017, Hill-Rom launched Centrella Smart+ bed Solution. The system is designed to provide patient safety, to enhance patient satisfaction through advanced caregiver-focused technology. History of medical bed can be dated back to early 1800s with the appearance of first adjustable side rails in Britain. In 1874, Andrew Wuest and Son, an Ohio-based mattress company filed patent for a type of mattress frame with hinged head that could be elevated manually, a predecessor of the modern day hospital bed. The evolution of the hospital bed changed drastically with the introduction of Gatch bed, a modern 3-segment adjustable hospital bed invented by Willis Dew Gatch in the early 1900s. Later, the push-button bed was invented in 1945. This medical bed underwent numerous improvements over the years. The modern day medical bed come with standard features including automatic elevation in three parts, wheels, adjustable side rails and tilting options. Moreover, demand for specialist bed that help with the movement of immobile patients, such as those with severe spinal injuries is increasing over the last few years. Advent of technology coupled with focus of industry players on development of innovative products will augment the medical bed industry growth over the forecast period.